The embankment holding the railway line built in 1858 runs beside the site of The Castle, and the two arches built to support it changed the whole look of the village. 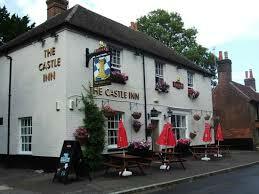 The Castle Inn was built in 1853, just before the advent of the railway in 1859. 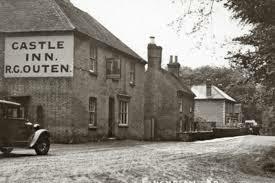 The Old White Hart Ale House, which previously occupied a nearby site, was the haunt of members of the Hawkhurst Gang of Smugglers. In 1748 the landlady Mrs Payne welcomed the gang and helped to send two customs officers on the path to their murders. Over in Poole, smuggler John Diamond started off the horrific events by storming the Customs House to retrieve “his” Contraband Tea impounded there. After the raid the gang were seen in Fordingbridge. A shoe maker, Daniel Chater on hearing of the two hundred pounds reward for information regarding Diamond informed on him and he was duly arrested. uniform did not stand a chance. They were lashed to a horse, then dragged up Bowes Hill and through the country to Rake, where William Galley was buried in a shallow grave. Two days later, Chater was thrown down a well at Ladyholt Park. lt was only after sometime that an anonymous letter was received and seven members of the gang were apprehended and hung in Chichester in 1749. From then on violence slowly decreased.